An incredible ride through the beauties of Florence. The town will be under your feet and you’ll get it all in a glimpse. A running tour that passes Florence’s most beautiful and famous squares and architectural pearls. Starting from the former center of the roman “Florentia” during this running tour you will pass through the medieval heart of the town and see Piazza della Signoria, the Uffizzi, Ponte Vecchio, some hidden corners and surprising spots like the old city walls. The Basilica of Santa Croce will impress you with its magnificent front while the Ponte Vecchio will bring you over the Arno. Runners will be able to view the small gold shops that are still today located on the bridge. On this running tour, we will also pass by the world famous Uffizzi Museum that is renowned for its art collections. You’ll learn some histories and jokes about the town that only real Florentine people know, so this tour will be not only made of history and wonder but also of sweat and fun! 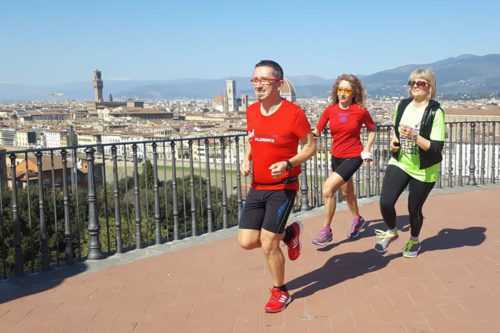 While we run, we will tell you some secret stories about the ancient buildings, like the famous dome of Santa Maria del Fiore by Filippo Brunnelleschi, and the ancient families, the Medici, the Pitti and many others from the so called “cradle of Renaissance”. This running tours is a dive into history and beauty suitable for every kind of runner, and will be a nice group experience that you’ll bring back home as a special memory. The tour duration is approx one hour.